A lot of people use Internet the same way they use TV, radio and newspapers: they grab the information others have produced – nothing more. This strikes me as a little odd since the Internet is intended as a platform for interaction. Not since Speakers Corner, there has ever been a place more dependent on the contribution from the public. Use the possibilities the Internet brings, but please do not hesitate to contribute with all the fantastic things you know about, have special feelings about or at least have an opinion about. If you don’t know where to add wisdom to the Internet, you can write it in a comment to this post. This entry was posted in BaseWord on 22 October, 2008 by Erik. 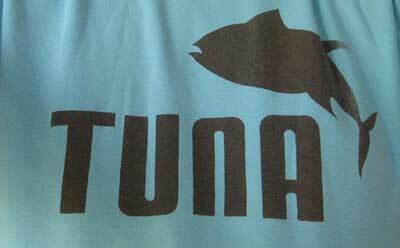 This morning, I put on a t-shirt with a “Tuna” logo (a spoof for a famous brand with another animal). In the mirror, the t-shirt said “A nut”. This entry was posted in BaseWord on 17 October, 2008 by Erik. “One day when he was out walking, he came to an open place in the middle of the forest, and in the middle of this place was a large oak-tree, and, from the top of the tree, there came a loud buzzing-noise. Winnie-the-Pooh sat down at the foot of the tree. Put his head between his paws and began to think. Alan Alexander Milne’s book ‘Winnie-the-Pooh’ was released 82 years ago today, on October 14 1926. I like bees for the same reason as Pooh Bear: Honey. But this summer, I have noticed a disturbing lack of bees. I have heard about parasites being the reason for a recent decline in the population of bumble bees, but scientists believe that this parasite does not affect honey bees. But it is a fact that the honey industry has been plagued with colony collapse disorder in recent years. I do not know if another plague is also worldwide or just a local phenomenon. But this year has shown a disturbing increase in spiders. I may have seen more spiders this year, than all other years combined! I do not like spiders. I hate spiders! But seeing so many has almost made me loose my fear for spiders. But I still do not like them at all! This entry was posted in BaseWord on 14 October, 2008 by Erik. Summer is just a memory. Winter is probably on its way. Spring is only a rumour. This is autumn. Regular visitors will notice the unstable delivery of blog posts. I expect improvements soon. This entry was posted in BaseWord, PhotoBase on 12 October, 2008 by Erik. I keep a lot of stuff I really do not have any use for. Only keep things that are useful or beautiful! This entry was posted in BaseWord on 1 October, 2008 by Erik. Every time I've built character, I've regretted it.